By Karol L. Kazmierczak, CSI, CDT, AIA, ASHRAE, NCARB, LEED AP, and Jerzy Tuscher, M.Sc. It is safe to suggest there are many architects and building owners who do not like the ‘industrial look’ associated with the means of façade access. However, once a beautiful building is occupied, there must be a way for others to maintain, repair, and inspect the claddings and façades well above the ground. Early inclusion in a design may minimize the esthetic impact. This article deals with systems like building maintenance units (BMUs)—essentially, roof cranes—that provide a permanent means of façade access; this is not about the temporary ‘general conditions’ of a new construction site. The distinction is important because some architects might dismissively wonder whether this is all simply the general contractor’s task, confusing the hoists and scaffoldings of a newly erected building with house cranes and gantries of a building in operation. Some facility owners, meanwhile, may question the need for BMUs because they feel the systems will be used infrequently or out-of-house contractors will be hired. However, pushing the provision of access on contractors results in either more expensive maintenance or cutting corners in safety. Considering future work to be done by building inspectors, window-washers, and maintenance specialists is very much part of the design professional’s responsibility. A building maintenance unit (BMU) is one way for allowing access to the façade for inspection and window maintenance. How many designers does it take to change a light bulb? A few years back, an overhead lamp at one of the train stations along a New Jersey Transit line needed to be replaced. This seemingly simple task became more complex than any bad punch line—it required use of two cranes; one lifted another through a hole cut in a roof at the expense of tens of thousands of dollars. The architect explained the particular building façade’s access was sacrificed on the altar of a subjectively perceived beauty: a desired dramatic visual effect of a skylight, void of any unsightly obstructions. Not too long ago, this author was involved in an investigation of 13 irreparably damaged glass panes in two adjacent, brand-new residential apartments. Glass replacement was estimated at $650,000. At that price, one might wonder whether the glass was covered with a layer of a precious metal to justify the elevated cost. (Technically, it was—but this is the case for any regular, off-the-shelf, low-emissivity [low-e] glass.) Indeed, the material accounted for only seven per cent of the total cost. 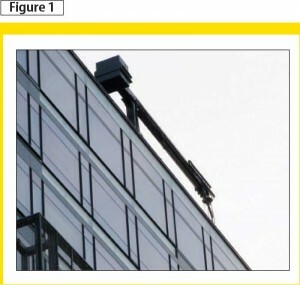 The high price tag was due to the need to have a 36.6-m (120-ft) hydraulic truck crane in spite of the addition of a BMU installed on the roof (Figure 1). Using a truck crane required negotiations with the city to close a busy street for traffic (twice—due to the curing duration of a structural silicone sealant). The expensive house crane not only had insufficient reach, but also indirectly contributed to the glass damage problem. The BMU’s weight was not initially calculated into the building structure. To carry the loads after the top floor was already closed, the roof slab needed to be remedially strengthened by welding thick steel plates underneath. To make matters worse, the weld splatter generated by the heavy construction operations irreparably damaged glass throughout the top floor. This is how costly a lack of design co-ordination and planning of façade access can turn out to be. Window-washing is a requirement under most glazing warranties. A boatswain chair is a frequent means of getting the job done. 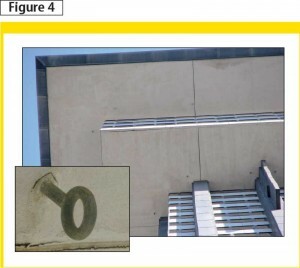 On many buildings this author inspects, even the most elementary tie-off anchors are frequently missing—in other words, there is no reliable spot to secure one’s fall-arrest system. (This is why I bring my own concrete drill, while window-washing contractors drag concrete or water-filled tanks instead.) How does this happen, given the inherent liability attached to such an omission? In one particular case, the architect did not initially design the anchors, therefore they were not included in the budget. When I spoke to the owner, the building was already in the construction phase and over budget—the addition of tie-offs would require strengthening of the structural steel to take the 2270-kg (5000-lb) reaction at each davit’s location. The building is in operation now, without any fall-arrest protection. Of course, it is not solely façade inspectors who rely on these safety measures. Frequent window-washing is required under most glass warranties (Figure 2). The well-being of individuals performing work at elevation is the owner’s and/or building manager’s responsibility. An out-of-house crew is subject to the same rules of gravity as the in-house employee and deserves the same safety measures. Design professionals should educate the owner about safety regulations and propose workable solutions to fit the budget. 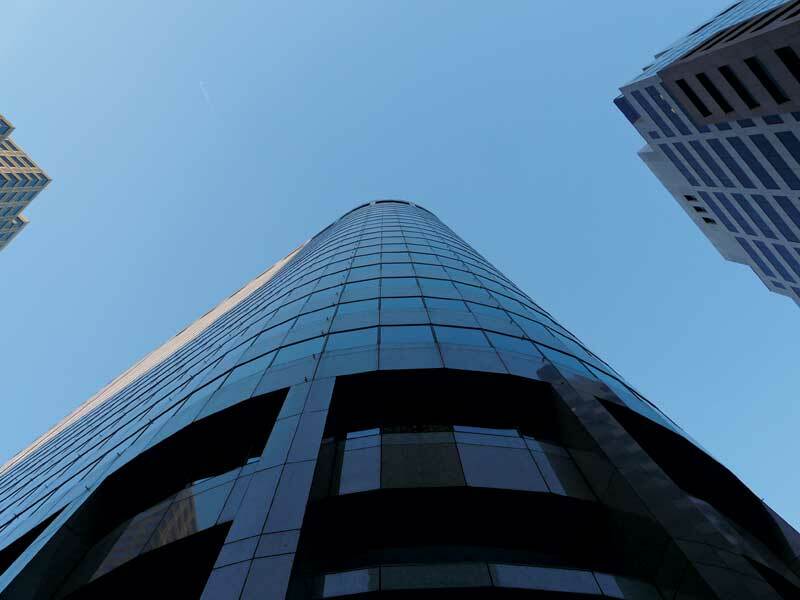 The need for façade-access systems must be explained to building owners early in the design process to ensure room is left for reasonable budgeting. Theoretically, an owner of a high-rise building may retrofit the façade or roof to allow access after the completion, but there are many factors rendering this solution uneconomical and impractical, compared to the integrated design. The aforementioned strengthening of the structure to achieve the required structural performance of anchor points, interruptions and penetrations of roofing, and unsightly modifications of cladding are among them. 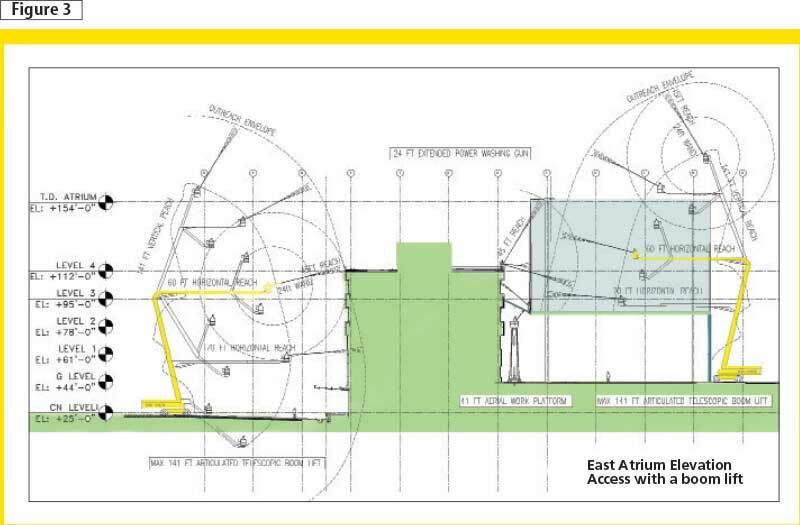 A façade accessibility analysis of portable lifts and boatswain chairs. 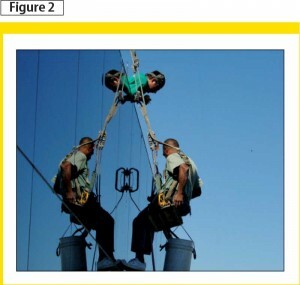 The primary access system must be doubled by a personal fall-arrest system. However, in addition to people, repair work requires transportation of tools and materials. This complicates matters due to limited weight capacities. For example, a single pane of glass may weigh as much as 680 kg (1500 lb) on the average building. Therefore, a façade may require a tertiary hoisting system to lift the materials in addition to the access and fall-arrest systems. Figure 3 depicts a façade accessibility analysis of portable lifts and boatswain chairs. 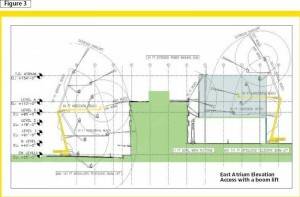 The typically overlooked areas of concern are interior yards and perimeter security berms, along with intervening roofs and sloped glazing below walls and overhangs, which restrict access of portable equipment (Figure 4). A good rule is to have a roof hoist for transporting materials on and off the roof, and rolling gantries under and over all elevated sloped glazing. Unless specifically engineered as a floor, sloped glazing is not a walking surface. Items requiring frequent maintenance (i.e. gutters, drains, and all waterproofing or roofing subjected to prolonged water contact) should have adequate access. An anchor installed in the large overhang of a high-rise building. A worker must be provided with a fall-restraint system when approaching a distance 2 m (6 ft) from a fall hazard—a term that includes skylights and sloped glazing. A façade should be served by a system of roof davits spaced no more than 3.7 m (12 ft) apart to allow support of powered platforms and lifelines, and located so the ropes should not turn more than 75 degrees from the façade plane. A façade stabilization system should be provided on buildings higher than 39.6 m (130 ft) to restrain lateral movement of the equipment, even though a high-rise may be successfully served by a road crane. A simple one would consist of window-washing pins spaced 15 m (50 ft) apart; a sophisticated system includes a tie-in guide rail (i.e. mullion track). This author once inspected a 213-m (700-ft) high-rise façade from a corner swing stage, when a sudden gust of wind swirled the platform 180 degrees, hitting and damaging a perpendicular curtain wall of the inspected building. The power cables, motor ropes, and lifelines twisted and tied together. This accident would not have happened if the façade stabilization system was used. storage zones for heavy equipment. Safety issues aside, lack of co-ordinated design may produce a mess on a roof—the very portion of the building shielding it from elements.